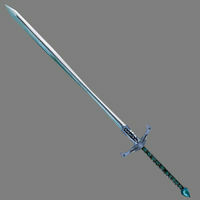 The Ice Blade of the Monarch is called one of Tamriel's most prized artifacts. Legend has it that the evil Archmage Almion Celmo enchanted the claymore of a great warrior with the soul of a Frost Monarch, a stronger form of the more common Frost Atronach. The warrior, Thurgnarr Assi, was to play a part in the assassination of a great king in a far off land, and become the new leader. The assassination failed and the Archmage was imprisoned. The Ice Blade freezes all who feel its blade. The Blade goes from owner to owner, never settling for long. The Nerevarine reportedly sold it to the Mournhold Museum of Artifacts in 3E 427.